2. Interface, performance, and battery life. Foot long! Get your foot long! 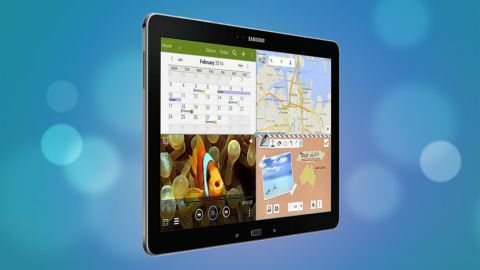 The Samsung Galaxy Tab Pro 12.2 is a power house that can handle tasks such as Multi Window with ease. The impressive 12 inch screen is somewhat let down by the rear of device, which feels less than premium. Samsung has been known in the smartphone and tablet market for its larger screens, and the South Korean giant has not disappointed this time around by releasing the Samsung Galaxy Tab Pro 12.2. As the name suggests it boasts a whopping 12.2-inch screen, although it's missing the S Pen stylus of the very similar Galaxy Note Pro 12.2. Other tablets of this screen size are few and far between, although the Microsoft Surface Pro 3 will give Samsung a run for its money in the 12-inch market. Samsung's continued ethos that 'bigger is better', has now reached a point where it is almost in a league of its own. Retailing at £549, $545 (around AU$995) the Galaxy Tab Pro 12.2 is unlikely to be an impulse buy. However, if you were weighing up the pros and cons of splashing this much of your hard earned money on a device, you will be pleasantly surprised to find out that retailers are currently slashing the price of the tablet by almost £100. Which I personally think makes this a much better purchase. The Samsung Galaxy Tab Pro series were all announced during the 2014 CES and are aimed to be the premium model line of Samsung Galaxy tablets, along with the Samsung Galaxy Note tablets. The Tab Pro 12.2 and Note Pro 12.2 stole the spotlight as the biggest and most powerful devices, but the smaller Galaxy Tab Pro 10.1 and Tab Pro 8.4 compete well against devices like the iPad Air or Google Nexus 10 - so what can we expect from the Samsung Galaxy Tab Pro 12.2? The Samsung Galaxy Tab Pro 12.2 comes in a choice of either black or white, and is powered by a whopping eight-core processor running 1.9GHz Quad and 1.3GHz Quad cores. When this is combined with the 3GB of RAM also on board tasks like Multi Window are certainly a smooth experience on the tablet. As expected all the usual connectivity is built in, but there are a few extra features that you may not find on all other tablets. The Galaxy Tab Pro 12.2 ships with Wi-Fi 802.11 a/b/g/n/ac, USB 3.0, GPS, Bluetooth 4.0, Infrared, a MicroSD slot (up to 64GB), 8MP Rear facing camera with flash, and a 2MP front camera. Samsung has managed to fit all this into a device which is 7.95mm thick and weighs 734g. Oh, I forgot to mention the huge 12.2 inch TFT display with a resolution of 2560 x 1600. The 4 million pixel picture with 16M colour depth provides a high resolution viewing experience. The Samsung Galaxy Tab Pro 12.2 has been well designed, it is appealing to the eye, but by no means will it break into new territory. There is a brushed metal effect steal band that wrapped around the edge of the tablet accommodating two speaker grills, the lock and volume controls, a microSD port and a microUSB connection for charging and connectivity. Next to the home button on the Samsung Galaxy Tab Pro 12.2 is an icon to show all open apps, along with the back button. The rear of the device is made of plastic, but has been shaped to imitate leather. Personally, it is not to my taste, however I was impressed at the lengths Samsung has gone to imitate a more organic shell. Imitation stitching surrounds the edge of the rear, and the first time I picked up the device I needed to take a second glance to confirm it is all formed from one piece of plastic. The Tab Pro 12.2 is light enough to be able to use with one hand, although this means the tablet does not feel overly sturdy, and even regularly produces tiny creaking noises. This is not the best sign that the device has been built to a high standard - only time will tell if the Tab Pro 12.2 has been built to last. Next Page Interface, performance, and battery life.